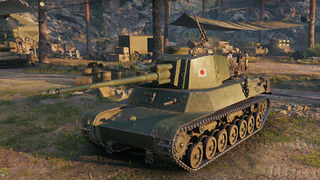 The Type 4 Chi-To is a Japanese tier 6 medium tank. being completed before the end of the war. The Type 4 Chi-To leads to the Type 5 Chi-Ri. The Type 4 Chi-To trades armor for gun depression and rate of fire, which allow this tank to excel in a support role and when executing flanking maneuvers. Slow acceleration, bulky size, and paper thin armor make this tank weak to HE rounds and getting caught out in the open. 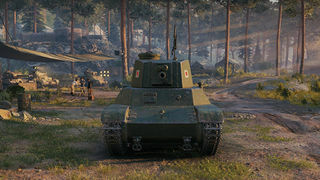 Be sure to maximize cover as much as possible, as well as attempting to hull down to make use of the 150mm gun mantlet armor and solid gun depression. Be aware that the stock turret only has 7 degrees of gun depression, but still gets the 150mm thick gun mantlet. 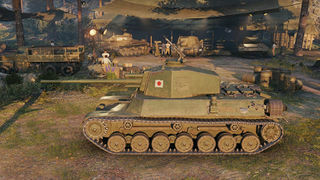 The Chi-To's good maneuverability and fairly high rate of fire (~3.4s) make it an excellent tank for flanking. It's possible to maneuver around the side of many heavier tanks and take 2 or even 3 shots before quickly retreating behind cover without taking any damage. Stay on second line and follow a heavy tank, let it take the enemy fire and use your good RoF to do a lot of damage while enemies doesn't notice you're the true source of damage. Research the 400HP Mitsubishi AL Type 4 Kuurei V-12 first. Without it, the Chi-To is slow and cumbersome to handle. Third, upgrade to the Chi-To Production Tracks. 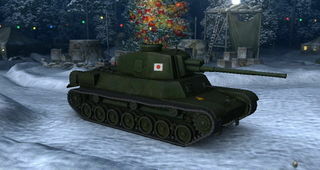 Japan expected that a new generation of tanks capable of tank engagements would be needed later in the war. 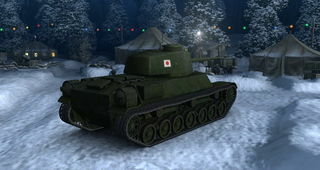 In 1942, three medium tank classes were initiated. A 47mm cannon class, a 57mm cannon class, and a 75mm cannon class. These three classes were called Kou, Otsu, Hei respectively (something like A, B, C). It was soon considered that the 47mm cannon class medium would be obsolete before completion thus it was upgraded to a 57mm cannon class tank. The other 57mm cannon class medium merged with the 75mm cannon class tank. 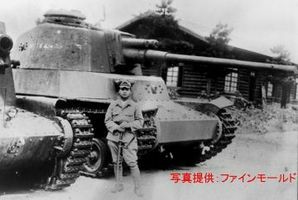 Thus these two, the 57mm cannon class tank and the 75mm cannon class tank, were respectively the Chi-To and the Chi-Ri tanks. In the beginning plans were for a 20 ton tank with 50mm of armor with new features like an electrically driven turret. By February 1943, plans changed to 75mm armor, the 57mm cannon and top speed of 45kph. For a bigger tank, a new engine started development by Mitsubishi and AL in 1943. The result was a air-cooled diesel 412 horsepower at 1800 rpm. Multiple types of suspensions were examined such as the staggered road wheel layout from Germany (Chidori) and torsion bars. but the Japanese settled with what they were familiar with, the coil springs. The 57mm cannon prototype was completed in March 1944. It completed testing and was officially named the Chi-To in May 1944. 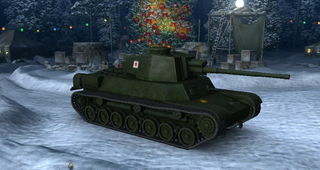 The Type 4 Chi-To was a thirty-ton, all-welded medium tank with a maximum armor thickness of about 75 millimeters (3.0 in) on the frontal plates. The tank was 6.73 m (22.1 ft) long, 2.87 m (9 ft 5 in) high, and 2.87 m (9 ft 5 in) wide. The Type 4 had a crew of five men. The tracks were supported by seven road wheels. 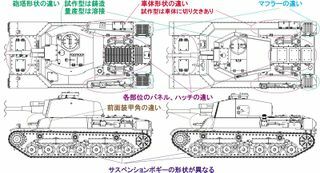 It was powered by a 300 kW (400 hp) engine, which was significantly more powerful than the 180 kW (240 hp) engine of the 19-ton Type 3 Chi-Nu tank. This gave it a top speed of 45 km/h (28 mph). The main armament consisted of a long-barreled Type 5 75 mm Tank Gun which was a variant of the Japanese Type 4 75 mm AA Gun. The gun was mounted in a large, hexagonal turret. A single 7.7 mm machine gun was mounted in the hull. 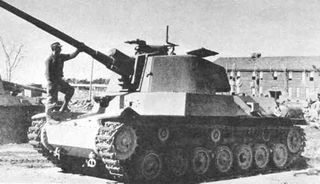 Chi-To prototype with the 75 mm Type 5 cannon. 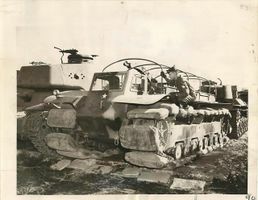 Photo of Chi-To prototype behind a Type FB Swamp Vehicle, the latter of which is being inspected by an American soldier. The Chi-To did not have the 75 mm Type 5 cannon, but rather the 57 mm gun. Diagram of various Japanese tanks' gun depression. The production model of the Chi-Ri is the second from the bottom. * The Experimental 57 mm Tank Gun Shin that the prototype Chi-To was fitted with is unavailable on this vehicle.